The Travelon Anti-Theft Concealed Carry Tour Bag provides you with a safer way to carry. Front compartment with the tamper-secure locking zippers helps keep unwanted hands out and features a rigid board with hook and loop and a left-right reversible holster. For layered protection, this bag includes designated pockets for pepper spray and a knife. The main compartment organizer includes RFID protected card and passport slots, a padded, fleece lined pocket for iPad or tablet, and tethered key clip with led light. The Front zip pocket is perfect for quick reach items. Side expansion pockets keeps water bottle or an umbrella within reach. The anti-theft features include slash-resistant construction, locking compartments, slash-resistant and locking straps to keep you and your belongings protected. 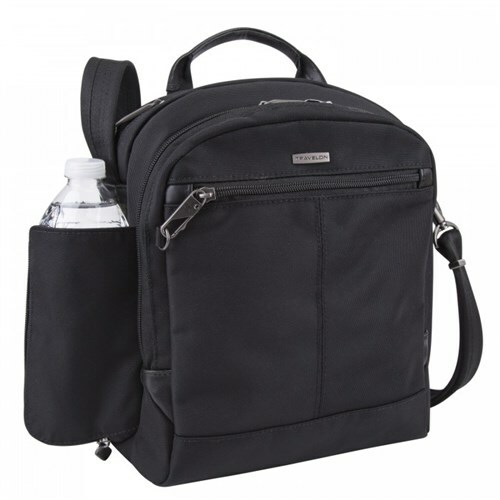 The Travelon Anti-Theft Concealed Carry Tour Bag - Black has many exciting features for users of all types. You can extend the lifetime of your Travelon Anti-Theft Concealed Carry Tour Bag - Black with the purchase of a FactoryOutletStore Factory Protection Plan. See the Travelon Anti-Theft Concealed Carry Tour Bag - Black product video and gallery images above for more details. 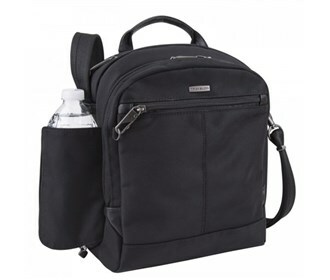 The Travelon Anti-Theft Concealed Carry Tour Bag - Black is sold as a Brand New Unopened Item.